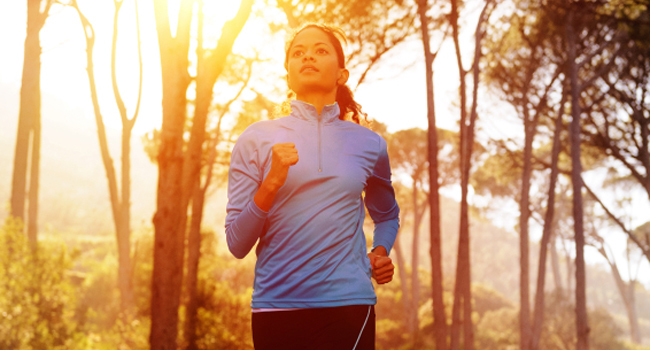 Cooler weather and shorter daylight hours can benefit your running. Here’s how to make the most of Autumn. Most runners love Autumn. The blazing heat of Summer is behind us, the school holidays are over, and your favourite running routes look beautiful as the seasons change. Take the opportunity to kick your training up a notch in Autumn. Here are 5 ways to use the weather, temperature, and environment to your advantage in October. Everything looks different in Autumn, as the leaves change and colours explode. Make sure you get yourself off the beaten track to explore. Whether you’re training for a race or enjoying some off-season down time, it’s the perfect opportunity to find some new routes. Explore footpaths, trails, canal paths, and parks. Why not spend some time looking at a local map to find new routes or ones you haven’t run in a long time? You’ll be rewarded by some beautiful scenery. This is a great time of year to include more trail running in your weekly schedule. Not only does off road running cushion your joints, but it provides a whole new set of stimuli to your joints and muscles, helping you tone up in new places! The slightly uneven and unpredictable terrain forces your body to work harder, using the core, glutes, and hips to stabilise you. And of course going off road will give you a new set of views to enjoy. How about taking it one step further and actually doing a cross country event? If you’re a running club member, you may have access to official cross country races. If not, search online for trail races, off road races, and cross country events. You’ll need different shoes (trail shoes, or even cross country spikes) and a specific training plan. But the first step is in committing yourself to a race. There is life beyond road races you know. Go on, we dare you! You will certainly notice the benefits come Spring… stamina, strength, speed, and more. If you run simply for the enjoyment of it (or to get fit or lose weight) then set yourself a very basic goal for Autumn: to stick with it! Imagine how you’d feel by Christmas if you had a solid, serious running habit locked in. This could mean twice a day, or five times a week. Whatever you want to achieve. Get started now and use these Autumn weeks to nail the habit and make running second nature. As the seasons change, your kit needs to change too. Make smart choices and your Autumn running will be more comfortable and enjoyable. Does any of last year’s Autumn/Winter kit need replacing? Have you got enough layers (base layers, gilet, leggings, and outer layers are good choices)? What about the essential little extras like gloves, a hat, good socks? Make sure you have some reflective or high-vis kit too. There’s no need to back off the training now Summer is over. And Autumn definitely doesn’t have to be a time to hibernate. Push yourself on and enjoy feeling fit, healthy, and happy right through Autumn and into Winter.